The other name of a serene paradise nestled amidst the snowy Garhwal Himalayas is Nachiket Tal in Uttarakhand. Tucked away in the hilly Kumaoun region, Nachiket Tal surrounded by lush acres of greenery is the dream destination for trekkers and nature lovers. Located near the Uttarkashi, the journey to Nachiket Tal is equally exciting and allures a number of trekkers and nature lovers. Walk through the dense woodlands, meandering mule tracks and splash through the rippling rivers to reach Nachiket Tal in Uttarakhand. According to legends the son of sage Uddalak, Nachiketa had created and hence the name. The crystal blue lake in Uttarakhand is surrounded by lush acres of greenery and there is a temple beside the lake. One of the serene locales of Uttarakhand, Nachiket Tal is yet unexplored by the tourists. 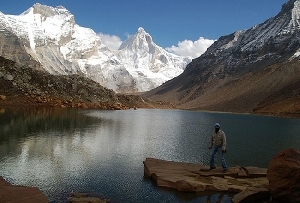 Explore the unspoilt beauty of this Himalayan Lake and bring home memories of your adventure tour in Uttarakhand.